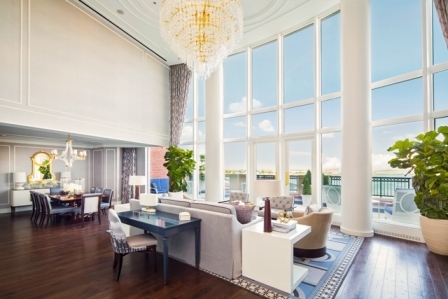 Located inside Boston Harbor Hotel's iconic rotunda, often referred to as the gateway to the city, the John Adams Presidential Suite boasts 4,800 square feet of the most luxurious living space the city has to offer. Guests of the John Adams Presidential Suite will be welcomed by land or sea to their unforgettable accommodations, featuring an exclusive private entrance and non-stop elevator for total privacy. A custom stone-inlaid foyer leads guests into the open floor plan, where 20-foot floor-to-ceiling windows usher in an abundance of natural light and unparalleled ocean views. A 1,000 square foot private open air-terrace features panoramic views of Boston Harbor, equipped with ample outdoor seating, custom sound system, and outdoor heating. With the option to add one or two additional adjoining guestrooms, the extravagant suite welcomes the company of up to eight adults. The one-of-a-kind suite is equipped with a modern kitchen and butler's pantry complete Sub-Zero and Wolf appliances, a private bar stocked with top-shelf liquors and fine wines, and a serene dining area with seating for eight. A private media room features wall controls for the theatre-quality surround sound system and 93-inch flat screen television. Bluetooth equipped tablets throughout the suite give guests full control of the state-of-the-art sound system, with built-in speakers in all indoor and outdoor living spaces. Upon booking, John Adams Presidential Suite guests will have a dedicated personal concierge available from pre-arrival through the duration of the stay. The suite includes private transportation to and from Boston's Logan airport, with service directly to the private entrance at 30 Rowes Wharf. Amenities also include butler service (available upon request), complimentary breakfast, personalized liquor and wine selection, private internet, complimentary pressing, fresh floral arrangements, and a personalized welcome amenity. Guests will also have unprecedented access for personalized in-room dining by Boston Harbor Hotel's award-winning culinary team, led by acclaimed Chef Daniel Bruce. Please contact Colleen Riley, at criley@bhh.com to learn more.